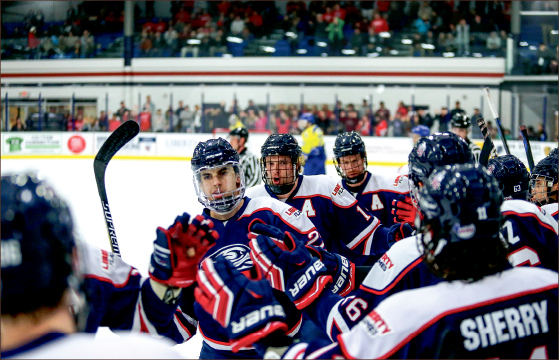 Liberty University men’s division I (DI) hockey team went one-and-done in this year’s American Collegiate Hockey Association (ACHA) DI National Championships with a 5-2 loss to four-time national champion Ohio University, March 5. The 11th-seeded Flames (25-11-5) fell to the 4th-seeded Bobcats (27-7-6) despite jumping out to an early, two-goal lead. It seemed an unfortunately fitting ending to an inconsistent season. On a team comprised of more than one-third new players and riddled with injuries all season long, the team was proud of its accomplishments and the foundation it laid for the season to come. Handy named the Flames depth their greatest on-ice strength moving forward, with four lines consistently contributing to the offensive cause and a diverse, experienced group of defensemen patrolling the blue line. When healthy, the Flames executed their system and consistently saw wins as a result. Handy pointed to the West Virginia series and, in particular, the Minot State University series. The Flames will be tested by the departure of graduating seniors Matt Sherry, Lindsay LeBlanc, Ryley Egan, Cam Bakker, Christian Garland and Ryan Kerr, as well as Cary Byron and Ian Harris, Liberty division II (DII) and division III (DIII) goalies who joined the team midseason after their DI counterparts went down with injuries. Handy called LeBlanc “night in and night out one of the fiercest competitors,” naming LeBlanc and Egan as two of the team’s key scorers. He also called Kerr and Garland the “heart and soul” of the penalty kill unit and “unsung heroes of the team.” Handy mourned the loss of leadership and a defensive anchor in Sherry, and he called Bakker “an all-around dominant defenseman.” He expressed his gratitude for Harris and Byron stepping up to carry the team when needed. “It’s an excellent senior class, and I think we’re going to have a tough time replacing them,” Handy said. The good news is that while the seniors leave behind big skates to fill, the rising senior class and freshmen such as alternate captains Luke Hannon and Ben Hughes, among others, already seem to fit nicely. It was a bittersweet season to be sure, but the Flames are already gearing up for a deeper run at nationals next season.